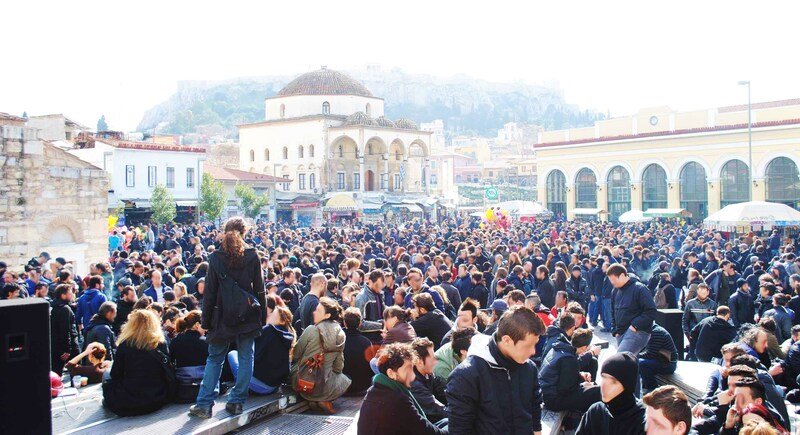 Nearly 5,000 protesters participated in the anarchist/ anti-authoritarian/ libertarian demonstration on Friday, February 4th, 2012, called for by several collectivities, squats, hangouts, assemblies and comrades. People gathered in Monastiraki Square from midday, and the march began at about 13.30. It crossed Athinas Street, arrived at Omonia Square, then progressed along Stadiou Street, around Syntagma Square, and ended in front of the Propylaea on Panepistimiou Street. During the demonstration, thousands of counter-informative leaflets and texts of anarchist agitation were shared out to passersby. On some occasions, people on the sidewalk applauded the demonstrators and a couple of elderly citizens even raised their fists in support; nevertheless, most of the passersby as well as homeless people across the demo route had blank and tired stares from the misery of everyday life, and only a couple of people joined spontaneously the march. While the demo was underway, various slogans were painted on the metropolitan walls. 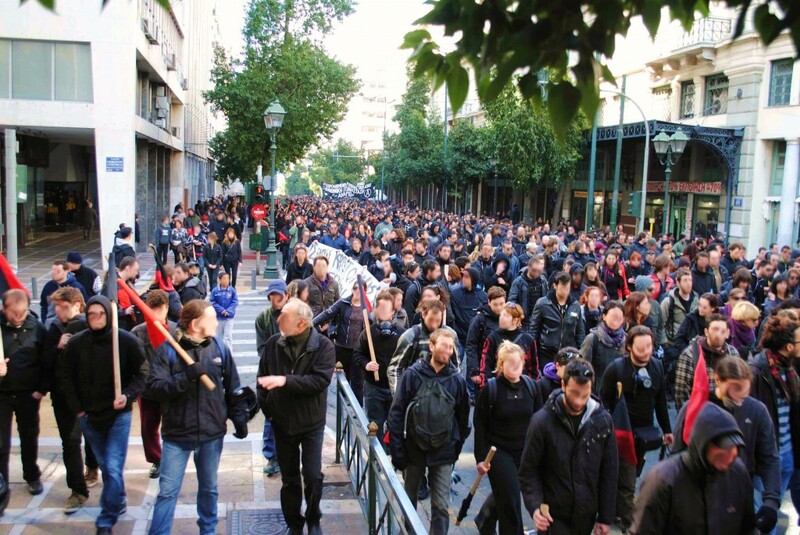 Despite the massive anarchist presence on the streets, where several political trends came together under the projectuality of social class counterattack, the demo gave the sense of a comradely walk, rather than a protest march, and breaks between chanted slogans felt at times as if they reflected our inability to give a firm and decisive response to the hardest issues that we all face today: How will we overthrow this system of death, which suffocates us on a daily basis? How can people be mobilized to meet revolutionary desires? Why won’t the words come out of our mouths that will give the definite blow to our consciences, so that the exploited will practice once again the multiracial revolt? How can we regain lost ground in the Struggle? There may be many, inside and outside the territory controlled by the Greek State, who believe that this event was a magnificent demonstration of strength which the anarchist movement has in its polymorphy and unity, and others who think that this was merely a good opportunity for agitation and propaganda; both may be right interpretations of what unfolded on February 4th in Athens. However, withdrawing from the demo and returning back home, a few of us were left with the indescribable bitterness that encapsulates the frustration, despair and submission of an entire society. Without wishing to dismiss neither the demonstration, nor our comrades who worked hard for its preparation, we finish this note by saying that the manifestation ended ‘without undesirable incidents’. - People, you’re starving; why do you kneel down in front of them? People, you’re starving, why don’t you hang them? THE VIDEO IS SPEEK ITS SELF FROM THE MARCH IN ATHENS TODAY!